Event coordinator Lisa Peterson said the Jasmine room bar will be open and overflowing with munchies as well, so no need to worry about an empty stomach. There will also be raffle prizes in the Jasmine room. The Grand Manse is the perfect place for jerseys and cheering. The entrance fee is $5 and the games begin at 5 p.m. Tickets can be purchased at the grandmanse.com. If you have any questions, then you can contact the Grand Manse events at 402-476-4560. 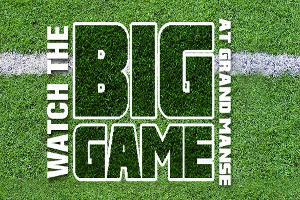 Bring your love for football and come watch the big game.